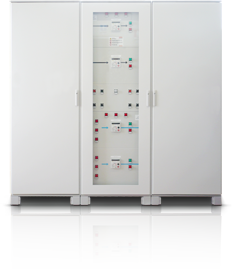 These boards, which consist of many input units, bus bars and few output units, are usually set at the end of MT/BT transformers or generators. Their making consists in a closet, with a metal envelope, and divided cells with forms of isolation from 1 to 4. A strong framework can stand electro-dynamic pleas and the weight of great devices. Power centers are characterized by high values of nominal currents and short circuit.